As businesses grow, office managers won’t be able to stamp, stuff envelopes, and take mail to the post office forever. Pitney Bowes mailing equipment like postage meters and digital mailing systems help streamline this task so your employees can focus on the core of your business. Let’s take a look at the main differences between a postage meter and digital mailing system to help you decide which would be the better option for your office. Send mail without leaving your office. 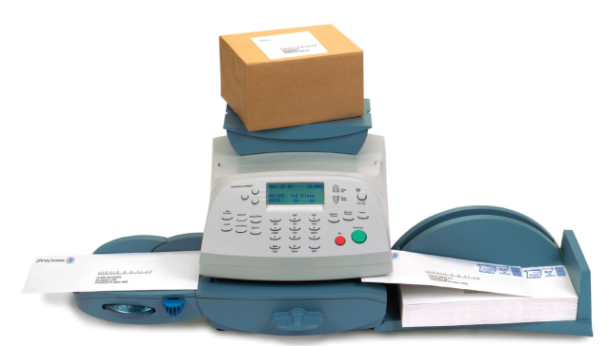 A small, compact postage meter like the Pitney Bowes mailstation2TM is an ideal option for small businesses with modest mail volume, around 100 pieces per month. When you meter your mail with a Pitney Bowes postage meter, you can also save 3 cents per letter compared to stamped mail. Enjoy effortless shipping and mailing, saving you valuable time and money. When your business needs to get mail out the door quickly and efficiently, consider a digital mailing system for a more automated workflow. Machines like the DM400TM Digital Mailing System from Pitney Bowes offer a user-friendly design so anyone in your office can use it. Need to mail packages? A digital mailing system provides an all-in-one solution for all your mailing needs. With an integrated scale, the machine weighs and calculates postage for each parcel, even printing it on an adhesive strip for easy scanning. Whether you choose a postage meter or a digital mailing system, don’t forget the Pitney Bowes SendPro® software system to make running your business even easier. With this software, you can enjoy greater flexibility in shipping options, savings on postage, and overall workflow improvement.